That is why it was empty for so long. I couldn't decide how to define my blog. Is it healthy food, lightened up desserts, lower-fat entrees, quick and easy dinners? Or a little of all of those things? So I thought maybe I should put up a bunch of different photos of all different things. But then I thought it would probably just confuse people and look like a hodge podge. So I decided on the fresh veggies. They're colorful, healthy, low-fat, quick to prepare and truly represent healthy eating! I'm still tweaking it, so be patient, better things are yet to come. Speaking of better things, let me tell you about these chicken fingers and "chimchurri inspired" marinade and dipping sauce. Very easy to prepare, very health conscious, and super delicious. 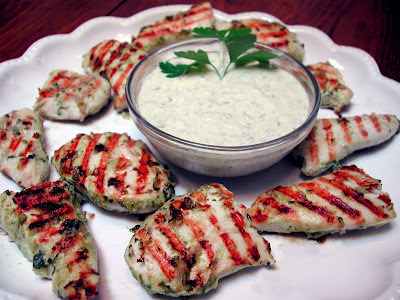 The marinade is very similar to a chimichurri marinade. I included a few different herbs and I used my signature leek instead of an onion. And for the sauce, I added low-fat sour cream. Very luscious! In a food processor or using a hand held immersion blender combine parsley, oregano, thyme, sage, rosemary, paprika, leek, garlic, lemon juice and vinegar. Pulse until everything is thoroughly combined. Continue pulsing and slowly add in all of the olive oil. Place chicken tenders in a shallow dish and add half of the marinade. Mix to completely cover chicken pieces. May be refrigerated overnight if desired. Add the sour cream to the reserved marinade and mix well. Transfer to a small dipping bowl. Set aside. Place the chicken pieces on the pre-heated grill and cook 3-5 minutes on each side. Transfer to a serving plate. Serve with reserved dipping sauce. Love the new blog header!! Thank you ANnie.these fingers are delicious ciao bambola. These sound so gourmet and delicious. I like the new header too. It looks really nice. They look wonderful! And I love the new header--it's so colorful! Like the recipe and love the new header!